Remember when finding a parking spot or being seated in a downtown Rockford restaurant on a Friday night was never a problem? Thankfully, those days are gone. Tour the east part of downtown and see what’s new and what’s in the works. It wasn’t all that long ago that the East Rockford Historic District was mired in a prolonged slump, of sorts. There was blight. Vacant buildings were the norm. Crime was a serious problem, and certain bars and nightclubs attracted unwanted attention. Streets were empty, so getting a table at a nearby restaurant was no problem. But what was once considered one of Rockford’s weak spots is now a source of pride. Today, the district has a different look and feel. The five blocks east of the Rock River to Third Street have seen remarkable change and growth in the past decade. Those once-empty storefronts are bustling with businesses – hair salons, coffee shops and specialty stores selling items from running shoes to fine chocolates. That’s not to mention a full lineup of restaurants including Abreo, Social Urban Bar & Restaurant, Deli Italia, Bamboo Asian Noodles and Tapas Bar, Kuma’s Asian Bistro, Vintage 501, The Capri and The Irish Rose Saloon, to name a few. People are living in lofts located above those businesses; hungry patrons are enjoying a noontime meal on the outdoor patio of downtown restaurants. Every Friday night, thousands of visitors flock to Madison Street for Rockford City Market, which has quickly become one of the city’s favorite gathering spots. And starting next year, thousands more will join the party when the Sportscore Downtown complex opens for business. The rise of Rockford’s east district dates back to the 1800s. It was home to the first post office and some of the first hotels in the city. In 1852, the first bridge in Rockford was built on State Street, and the Galena and Chicago Union Railroad reached the east side of Rockford, fueling the economy. The paving of State Street in 1889 brought another wave of construction, including a building for the YMCA. In 1904, the first Rockford City Hall was commissioned; in 1909 the Rockford Wholesale Grocery Building was completed, and the 1920s saw the arrival of the Midway Theater, the Manufacturer’s National Bank and the Faust Hotel. In the 1950s, the commercial district shifted from the east to the west side of the river. “Most of the department stores were on the west side as were most of the jobs,” says Anderson. “The east side was considered a secondary market. The Hess Brothers Department Store was the only real anchor store we had on the east side. In 1978, the city formed the Historic Preservation Commission, a watch group that keeps tabs on local historic buildings. Some of those buildings are in the East Rockford Historic District, including Shumway Market Building, 713 E. State St.; the Midway Theatre, 721 E. State St.; and City Hall, 425 E. State St., which also is listed on the national register of historic landmarks. Gary Carlson, owner of a Rockford car dealership, is a longtime member of the commission. He’s passionate about historic buildings and has restored several historic homes, including his own home near the river. Carlson points to the federal government’s passing of the National Historic Preservation Act of 1966, which was a reaction to the failed urban renewal program of the 1950s and 60s, as the catalyst for change in downtowns across the country, including Rockford. By contrast, the success of the Historic Preservation Act can be seen in nearly any city in the U.S., says Carlson. One of the tools guiding city leaders in this endeavor is a downtown implementation plan. Working with numerous community partners, the city’s plan includes strategies designed to bring more business to the area, direct public improvements and allign resources, says Cagnoni. One idea that’s hatched from the plan so far is ‘Shop the Blocks’ – a series of events designed to draw people downtown to shop and dine from the river to Third Street. Retailers and restaurants bring their businesses outside to offer sidewalk sales and dining areas. A few parking spaces on First Street are turned into temporary “parklets,” a place where visitors can hang out and connect with friends, maybe play a game of checkers, bags or chess. With an influx of people and activities, safety is a top priority for city leaders and business owners. Some people believe the historic district area isn’t safe, but those who work and live there say that’s simply not true. While restoring the historic district has been a team effort, there have been a few leaders who stand out. One of them is Fern, founder and president of Urban Equity Properties. The Woodstock, Ill., native is a Rockford-based developer who owns 600,000 square-feet of property, a majority of it in the historic district. Among Fern’s projects are mixed-use buildings in both the 300 and 400 blocks of East State. The buildings have eight residential lofts on the second and third floors that range from 1,250 to 2,000 square feet, with 10 to 20 foot ceilings, hardwood floors, granite countertops and Electrolux appliances. The main floors of Fern’s two buildings are filled with commercial businesses such as Salvaged by Sonya, The Olive Oil Experience, Bath and Body Fusion, Wired Cafe and Woodfire Brick Oven Pizza. In 2014, Fern bought the Chase Bank Building at 401 East State St. The building is at capacity; Fern even recruited Missman Engineering to lease the south annex building, after the 6,000 square-foot-building sat empty for 20 years. “Many of the local businesses depend on the employees who work in this building,” he says. While Fern is relatively new to the area, Anderson has long been a supporter of the historic district. Downtown, he says, is part of the reason he came back home after graduating from the University of Illinois, where he focused his architecture thesis on downtown redevelopment. “I wanted to become a change agent and see what I could do to make things happen downtown,” he says. As president of an architectural firm that bears his name, Anderson designs a range of projects including municipal buildings, commercial and mixed-use developments, and residential. In 1983, he was ahead of the game when he designed a business complex called Spafford Square, 333 E. State St., in the historic district. Since then, he’s helped save the Eastside Center and Midway Theater from demolition, and he currently serves as president of the River District Association, a membership-based organization that works to promote neighboring businesses on both sides of the river. And that includes Loyd and Diane Koch, owners of the Prairie Street Brewhouse, 200 Prairie St. The Rockford couple bought the 85,000 square-foot building, located along the Rock River, in 2000, with the intent of developing it into a mixed-used facility. The Prairie Street Brewhouse includes the Rockford Brewing Company and restaurant, which is open for lunch and dinner, 10 loft-style apartments, four office suites, a 40-slip marina and a bustling banquet facility. The banquet room opened in 2010, in what was once an indoor space for a marina, and quickly became a popular venue for weddings, parties and special events. One of the most popular offerings at the Brewhouse is “Dinner on the Dock,” which draws hundreds of visitors for dinner and entertainment on Thursday evenings during the summer. In 2011, the Brewhouse was added to the National Register of Historic Places. Four years ago, Charles Ducharme and his wife, Brandi, opened their own business, The Olive Oil Experience, a store that sells olive oils, balsamic vinegar and spices, on East Riverside Boulevard. “We were driving home from my mother-in-law’s home in Missouri, where I tasted peach balsamic for the first time,” Charles says. “I thought Rockford could use something like this.” Nine months later, The Olive Oil Experience was born. Last November, the Ducharmes, who also sell their products at City Market, decided to open a second location, at 328 E. State St. in the historic district. Their 1,500 square-foot shop is attractive, with beautiful wooden floors, a black tin ceiling and olive-green walls that match the 4,000 square-foot sister location on Riverside. Earlier this spring, Sienna’s Kitchen Gourmet Shop and Eatery, 223 E. State St., a quaint restaurant that serves breakfast and lunch, opened on the corner of Madison and State streets. A month later, Woodfire Brick Oven Pizza, a City Market favorite, opened across the street in another Urban Equity storefront at 408 E. State St.
And some organizations are returning to their roots in the historic district. The YMCA recently moved its administration staff back to where it started. The building at 220 E. State St. housed Rockford’s first YMCA in 1889, but was sold seven years later and became the East Side Inn until it closed in 1968. Now called East Side Center, the renovated property serves as an office building. Without question, one of the historic district’s biggest assets is the Rockford City Market, which takes place on Friday evenings from May until early October, along Water Street between State and Jefferson streets. The market features local growers and artisans who sell handmade products, including vegetables, fruit, eggs, meat, cheeses, flowers, herbs, baked goods, wine and prepared food, and other unique offerings. Local breweries, live music, and free weekly kids’ activities are part of the mix. The city market opened in June 2010, and finished the first year with 19,000 visitors and 40 vendors. Since then, the market has grown every year. By the fifth season in 2014, the market drew more than 75,000 patrons to the historic district. This year, the market features a new pavilion that protects patrons and vendors from the elements, and a vintage market that is held one Saturday a month on the City Market grounds. The Rock River Development Partnership conducted an economic impact study in 2014, measuring the economic benefit of the market for both vendors and nearby businesses. The study revealed that visitors spend $3.9 million at City Market and neighboring businesses on those 20 Friday nights during the market season. About 90 percent of visitors to the market come from outside the downtown area. Two years ago, the Rockford Area Convention and Visitors Bureau (RACVB) created Stroll on State, a one-day free event that kicks off the holiday season with family-friendly activities such as a tree lighting, entertainment, a visit from Santa, shopping, horse wagon rides and fireworks. In 2013, more than 30,000 visitors packed into downtown Rockford for the first-time event. Last year, organizers estimate that attendance doubled to 60,000. “We really wanted to create a wow moment for the community where everyone comes together,” says John Groh, president and CEO of the RAVCB. “No one expected Stroll on State to grow that quickly, but people are happy and joyful coming together during the holiday season.” The RAVCB is now planning two additional special events geared towards adults for this upcoming holiday season. Beautification projects are also making a significant impact on the area. The City of Gardens, a Rockford Park District program, hangs flower baskets along the East State Street corridor. Two years ago, the RAVCB launched a Forest City Beautiful program that concentrates on 10 defined spaces in downtown Rockford. As part of the program, the RAVCB and volunteers from Rockford Sharefest spend a week in June installing plant material, removing overgrown weeds and repainting light poles, trash cans and benches. More good news is on the way. In 2016, the new Sportscore Downtown complex will become another historic district destination. The former Ingersoll building along the Rock River is being converted into a state-of-the-art sports complex that will draw thousands of participants and spectators to downtown Rockford, for volleyball and basketball tournaments and other special events. The building will have eight basketball courts or 16 volleyball courts, a restaurant with river views, meeting space, and two parking lots which will add 500 new stalls to downtown parking. The $28 million Sportscore Downtown complex is part of the Reclaiming First initiative, spearheaded by the Rockford Park District, City of Rockford, RAVCB and other public and private partners. Mark Stranig has lived in Rockford his entire life, but he never imagined living in downtown Rockford. That all changed earlier this year, when, while having lunch with his father, he noticed an ad for Urban Equities loft apartments along East State Street. Stranig, a pharmacist, was impressed. He moved in last January. 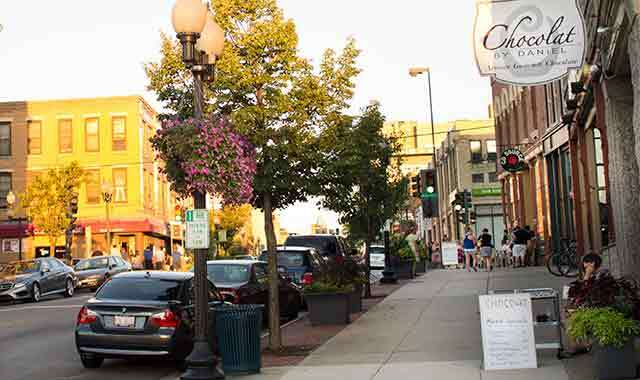 The recent developments taking place in the historic district are more proof of how leaders are transforming Rockford. “It’s wonderful to see how we’ve rebounded as a city, and there are even more positive things happening,” says Anderson. “But how great would it be to see our kids come back and be part of the success we’re generating? Rockford is no longer a place to flee from, but to be attracted to. We can become a Top 25 city. This entry was posted on Thursday, August 27th, 2015 at 11:59 am	and is filed under Features, Top Posts. You can follow any responses to this entry through the RSS 2.0 feed. Both comments and pings are currently closed. I live west part of downtown and would like to see a “real grocery store” down here. If they want more people to live down here that is a very important business needed. Also since the current library needs to be rebuilt or replaced I was thinking maybe the library and RVC get together and build or remodel a facility together maybe a building that would allow both to expand their services.